Teething puppies: The types of toys that require lots of chewing are a great way to redirect the energy of a teething pup to something they are allowed to chew. Fast eaters: If your dog is a food gobbler, certain toys and feeders like the Northmate Green Slow Feeder (photo inset below) and KONG Wobbler are great places to put your pup’s food! And they’re not just for kibble eaters. 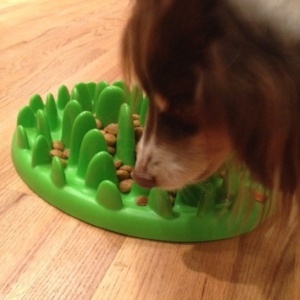 Some, like the Green Feeder, can also be used for dogs that are fed canned or raw diets. Using these puzzles for feeding will slow down your dog’s eating—which may also help prevent your dog from suffering from GDV/Bloat!—and keep them busy while they work to “earn” their food. Picky eaters: Puzzle toys are a great way to satisfy a dog’s natural desire to hunt and work for their food, which may just be the key to motivate your picky eater. Gives you a break: Puzzle toys provide mental stimulation and keep your dog occupied so you can get back to that crossword puzzle…. or just get dressed, get some work done, or even go to the bathroom in peace! 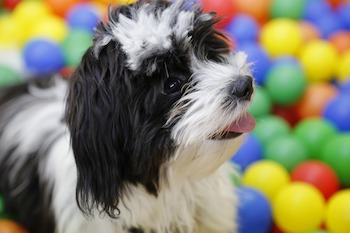 Keeps them busy in the crate: These toys can help occupy your dog while they are confined. Though, keep in mind that toys made to be tossed or rolled around may require a bigger confined space. If this is your dog’s first time with an interactive food puzzle toy, or the toy is much different than what your dog is used to, then they may need a little assistance at first. You may need to start with an easier toy, such as one that takes a simple nudge to get the food out. For example, the IQ Ball (see below) is one of the easiest for a dog to get dry kibble out of, and the Toppl (again, see below) can be easier for a dog to get wet or raw food out of when compared to a toy like the Kong. Similarly, when first introducing your dog to a new food puzzle, it can be helpful to use a "high value" food reward that's easy for your dog to get out. For example, you could start with small pieces of turkey hot dog or cheese that your dog will be interested in and that will more easily fall out of a Toppl or Kong. Then increase the size of the high value reward as your dog gets more skilled at using the toy, making it a little more difficult for them to get the reward out. As your pup masters the puzzle using these types and sizes of treats, increase the difficulty level by switching to high value treats with a creamier consistency (e.g., low fat yogurt, canned pumpkin, or peanut butter). If your pup isn't "getting it," it can help to actually show them how their new toy or puzzle feeder works. You can do this by batting the toy around to knock out the treats yourself. Or, if you have another dog at home who is used to the toy already, you can have your other (inexperienced) dog watch the experienced dog play with it. By engaging in this type of "social learning" your dog will start to understand how to do it themselves. If your dog is used to clicker training, you can mark and reinforce each of the desired behaviors in the process of learning how to play with and use the toy/puzzle, including touching the toy with their nose or paw, pushing the toy with their nose or paw, and so on until they’ve figured it out. They may create less predictable potty habits. With toys variably dispensing food or treats throughout the day, puppies or younger dogs whose potty training isn’t fully solidified will have a tougher time developing a regular potty routine. Dogs must be supervised in multiple dog households. If one or more of your pups tends to guard resources, then a puzzle toy tossed into the mix could be a recipe for conflict. But this problem can be easily avoided by separating your dogs during feeding or play time. 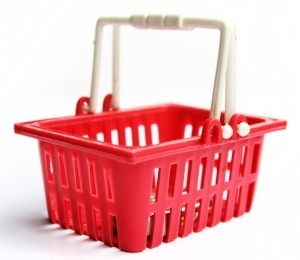 When shopping for interactive toys, there are a few things to take into consideration. Large dogs and strong chewers will need a size-appropriate toy that they can’t swallow, and perhaps something more durable if they are strong chewers. Small and flat-faced dogs also need a size appropriate toy that is small enough that they are able to play with it. They may also need softer toys since their jaws are not as strong. Kong: These are durable and come in different "strengths" and sizes - including specific ones for puppies, strong chewers, and the "classic" red Kong. You can fill them with some of your dog's dry kibble, or even with some canned food. These can even be frozen to help make them last longer. You can find plenty of "stuffing recipe" ideas on the Kong website. "Wobbler" by Kong: Unlike the regular Kongs, the Kong Wobbler is only for use with dry food and treats. It can be a great way to provide mental stimulation and slow down your dog's rate of eating. "Toppl" by West Paw Design: Modular and durable, the Toppl system by West Paw can be used with dry kibble or treats, as well as wet or raw food. And it's made with their durable and recyclable Zogoflex material! "Fun Feeder" Slo-Bowls by Outward Hound: These ridge and valley bowls can prolong your dog's eating and can be used with dry, canned, or raw foods. "Green Feeder" by Northmate: Looking like a tuft of green grass, these slow feeders can be used with dry, canned, or raw diets. There's a mini version of it, too. "Slow Feed Bowl" by PETBABA: These slow feeders can be great for small dogs and those with flat faces (e.g., pugs, bulldogs, etc. ), given the wider spacing and shallower valleys. They're also made from silicone, so are soft and easy to pack up and travel with. "IQ Ball" by Smarter Toys: These interactive puzzle toys can be filled with dry kibble or treats, which slowly dispense when your dog moves the toy. "Tricky Treat Ball" by Omega Paw: These food/treat dispensing toys are easy for your dog to grab and shake, or pick up and run with, for hours of entertainment. Only work with dry kibble or treats. Paper towel tube: Place kibble or treats inside a cardboard paper towel or toilet paper tube and fold the ends over for an inexpensive challenge. All dogs, young and old will enjoy playing with interactive toys, especially when they dispense edible rewards. As with any new toy, it’s important to supervise your dog in the beginning to ensure that your dog is playing with it correctly. This is both for safety reasons (to prevent them from choking on or swallowing chunks of plastic or cardboard) and also for confidence reasons (to make sure they’re able to “figure it out” and don't get frustrated or destructive). For further reading and ideas, I recommend a book called Beyond Squeaky Toys by Nicole Nicassio-Hiskey and Cinthia Alia Mitchell and also this Preventive Vet article about choosing appropriate chew toys and treats for dogs. What kind of puzzle toys do your dogs like? Got any other tips to share?—Feel free to tell us about your experiences in the comments section below.